Click here to view historic sales data for Calhan and Ramah. Scroll down to view the latest listings in Calhan and Ramah. Both located on the plains to the northeast of Colorado Springs, Calhan and Ramah each include smaller statutory towns and the ranchland in the surrounding area. Many available lots include permanent houses and barns located on large plots of land. These areas are ideal for folks looking to get away from the hustle and bustle of the city and live in opens spaces as far as the eye can see. Calhan began in 1888 as a water station for the burgeoning railroads spreading throughout the Pikes Peak region. Today, the area is home to several hundred households. Although the railroad has moved on, several attractions still make the trip to Calhan worth the visit. The Calhan Rock Island Railroad Depot was built in 1906 and still stands today as one of only three surviving depots of the railroad company that went bankrupt in the 1970s. The Calhan Paint Mines Interpretive Park covers about 750 acres and contains evidence of human life in Colorado from prehistoric times. Ranked as one of the world's most colorful natural wonders, the Paint Mines feature over four miles of hiking trails, informative historical displays, and beautiful scenery throughout. Every July, Calhan welcomes the El Paso County Fair with their own SummerFest on the Friday before the county fair starts. The fair itself includes the yearly Fair Queen Contest, carnival, demolition derby, and a variety of equestrian events. The Calhan Homecoming Parade brings back alumni each fall to celebrate the Calhan Bulldogs and award an annual scholarship to a qualified student. Additionally, the El Paso County Raceway is located in Calhan, and offers auto racing as well as a venue for County Fair activities. Ramah, an even smaller town just northeast of Calhan, is home to less than 200 residents. Beginning as another railroad stop, the citizens of the area turned to ranching after the decline of the railway. Raham includes a Post Office and a church, but the majority of the population lives in the surrounding open acreage. Calhan School District serves all of the students living in the area from Kindergarten to High School. Many other municipal services are shared with between the nearby areas, including the High Prairie Library in Peyton and the Calhan Municipal Court located in Town Hall. 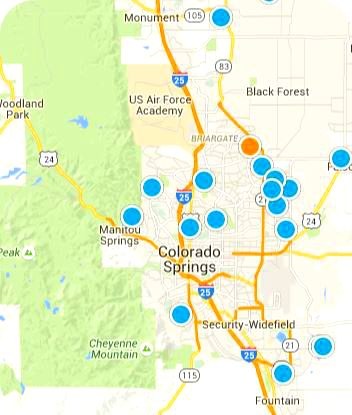 All other amenities are located just a few miles down the road in Colorado Springs.